Don t compromise every time you advertise! 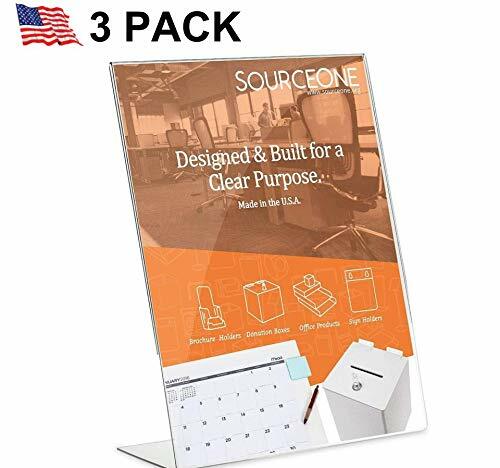 SourceOne Slant-Back Sign Holder is the ideal frame for your personal and professional brochures, promos, and pictures. This 8.5 11 inch sign holder is self-standing due to its reinforced solid-back base. There is an insertion slot on its side for papers bearing signs, text, and pictures. The frame can be propped up vertically or horizontally, so you can display images however you like without hassle. Made of high-grade acrylic, this transparent sign holder boasts top-notch quality, as evidenced by its exceptional durability. Acrylic is a shatter-resistant material that is lightweight but strong. It won t break even if it falls to the ground, making it ideal for high surfaces. The frame has smooth edges and is transparent, and it protects signs and pictures from dirt and dust so that text stays readable and images remain visually appealing. This sign holder serves a lot of purposes and can be displayed in many different places. It can be used to show restaurant bestsellers and brochures, package deals in hotels, new features in a reception area, and new regulations in schools. It can also be used to prop up personal pictures in homes. SourceOne items are always in stock. We offer a money-back guarantee, and we promise fast shipping. Your order will arrive fast and in good condition. Customers are our number-one priority because if you re satisfied, it means we ve done our job properly. Never settle for less and use only the best with SourceOne Slant-Back Sign Holder. SELF-STANDING. Self-standing and innovatively designed, the SourceOne Slant-Back Acrylic Sign Holder is the ideal frame for images, brochures, and advertising pamphlets. It displays pictures and posters efficiently, and stands on its own without difficulty thanks to its solid-back base. It can be displayed vertically or horizontally, as you prefer. PROFESSIONAL QUALITY. Made of top-quality acrylic, this clear sign holder features excellent durability and resiliency. It won't break even if it hits the ground, so it's ideal for high countertops. It has smooth edges and is transparent. It also protects its contents from dirt, so posters and images will remain readable. Acrylic is a shatter-resistant material that boasts great strength despite its light weight. MULTIPURPOSE. This sign holder is versatile, serves a lot of purposes, and can be put in many different backgrounds and locales. It's perfect for displaying bestsellers, new menu items, and other special offerings in restaurants. In hotel reception areas, it can be used to promote package deals and new features. In schools, it can display regulations and academic news. It helps you spread information by making it accessible to everyone. DIFFERENT TYPES. This package contains three pieces of 8.5 11 inch slant-back sign holders. Each sign holder has an opening on its side for easy paper insertion. Standard-sized paper works best. Landscape styles are also available for horizontal posters and pictures. *******BOXED BEFORE SENDING TO AMAZON TO AVOID ANY BREAKAGE!! ********* LOW COST FRAMES FOR DISPLAYING 8.5 inch wide x 11 inch high standard paper marketing material, our frames are the economical version to save you money. Scratch Resistant or Shatter Resistant - This is a marketing scam to get you to purchase - Unless other sellers specifically states it's Polycarbonate, acrylic will still crack, break or scratch upon use. Identical to some other well known Private Label Brands being sold on the internet.. Manufactured in Morris, IL USA - These are not an import being resold and passed off as made in the USA. (See Pictures). HIGH QUALITY - Made from high quality crystal clear acrylic with polished edges. Our sign holder has a lengthier back to secure your pictures or documents in place. STURDY PACKAGING - Each frame is wrapped in plastic to prevent scratches. Frames are packaged in a sturdy box with bubble wrap to ensure that they arrive in perfect condition. QUICK AND EASY INSTALLATION - Our acrylic frames come with 3M hook and loop double sided tape. Simple installation without any tools. SWAP OUT YOUR DOCUMENTS IN SECONDS - Our 3M hook and loop double sided tape allows you to easily remove the frame from its position, swap out your document/picture, and then place it back easily to its original position. HIGH QUALITY - Made from high quality crystal clear acrylic with polished edges. We use cast acrylic on all of our products because it has been proven to be stronger, more durable, and does not turn yellow like some of the cheaper imitations. BOTTOM LOADING DESIGN - Easily load or swap out your photos or documents from the bottom of the sign holder. This loading feature provides the added value of keeping out water, dust, and debris from entering the display from the top. MaxGear is a manufacturer and exporter since 1989. For years, We has been making all kinds of gifts for men & women, useful travel & office accessories. MaxGear is a specialist in producing quality goods in Business Card Holder, Credit Card Holder, Credit Card Wallet, Desk Organizer,Pen Holder, Sign Holder,Donation Box, etc. Our first mission is to gain customers 100% satisfaction with high-quality product and service. 100% warranty is available for every purchasing from MaxGear. MaxGear, with High-Quality & Acceptable-Price & Best-Service, provides a convenient-life to you. MaxGear, with Professional Manufacturer and Advanced R&D Team, provides a multiple gift-choice to you. MaxGear, with fashionable & creative designer, provides a splendid-decoration to you. 1. 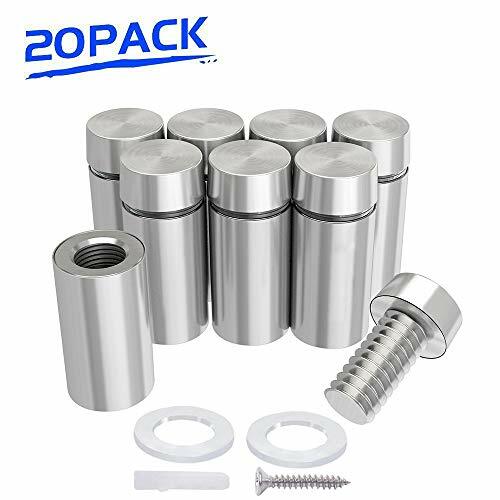 12 Pack, 8.35*3.2*11.9 inch with 0.24kg for each holder. 2. Material: High qality clear acrylic. Durable and readable. 3. Function: A ideal frame for images, brochures, advertising pamphlets and any important information. 4. Application: It can be used in restaurants, trade shows, exhibition, hospitals and any other location where you want to display your signs, certificates or advertisements. 1. 12 months warranty if any quality problem. 2.Within 24 Hours Instant Respond by Amazon Message, Carefree Service. Standard Size The size of each sign holder is 12x8.2x2.7 inches. This package contains 12 pieces of slant back sign holders. Each sign holder has an opening on its side for easy paper insertion. 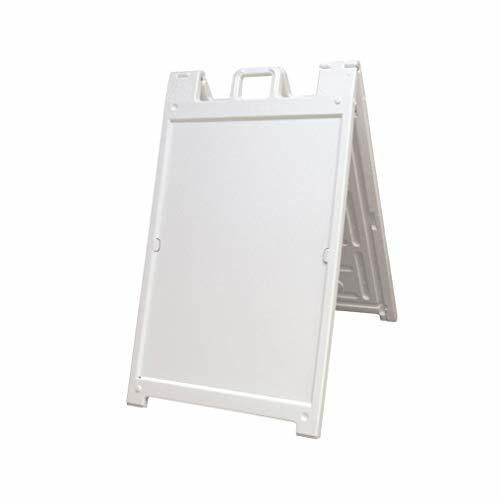 High Quality, Durable Construction Made of top-quality acrylic, this clear sign holder features excellent durability and resiliency. The plastic display stand is good to display information and protect content from scratches. Self-Standing, Convenient Display Because of its solid-back base, MaxGear slanted sign holder can conveniently stand by itself on any table and desktop without difficulty. Easily install or take out literatures from side, the paper will not slide out itself. Multipurpose Perfect for displaying menus, drink specials, important announcements, photos, brochures and advertising pamphlets. It can be used in restaurants, trade shows, exhibition, hospitals and any other location where you want to display your signs, certificates or advertisements. As a Amazon Brand Registered Seller, we never AUTHORIZED any other sellers to sell our MaxGear Brand items, hope all our valued customers pay more attention on the issues. Any purchase from MaxGear can get 100% satisfaction guarantee within 12 months. Any questions, 24 hours instant response. Order it without any risk. The SNAP SHUT MESSAGE CENTER REAL ESTATE BOX box includes the following BEST-IN-CLASS design features EZ Auto Close Snap Shut Lid Lid automatically closes and has reinforced ears so the lid is not easily removed or broken off. EZ Card Message Feature Eliminates the empty brochure box problem. Users can now print a customized message for each new listing conveying critical information such as price, square footage, and contact numbers by using a standard size businesscard paper. EZ Pull Large access area enables brochures to be easily withdrawn. EZ Mount Multiple mount convenience. You do not need to remove front panel to access mounting holes. BRIGHTFLYER is the only box in the market with strap holes so you can use standard cable ties to mount the box to just about anything. EZ Dry BRIGHTFLYER has a sprinkler guard to prevent water from shooting upwards into the box. The box has also a ridged bottom with small drainage holes on the bottom to remove moisture and ensure the interior of the box is always dry. 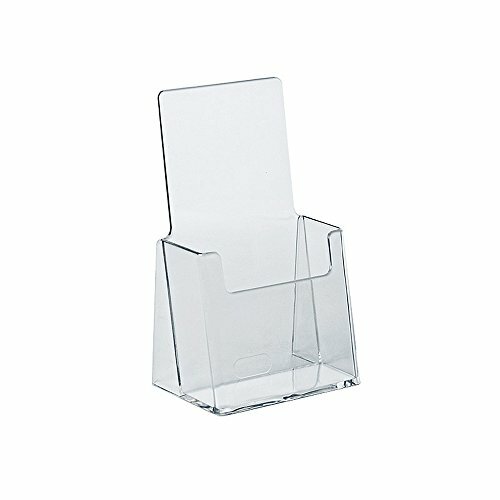 Pack of 100 Plastic Wire Shelf Label Holder, Sign and Ticket Holder, Easy Clip Design with Tight Snap Lock Closure. Height, 1-1/4" X Width, 3"
Open face design, with insert feature, easily accepts common 1-1/4" height or 1-3/8" height data tickets, tags or signs of varying widths. Attaches quickly and easily to wire baskets, grids and displays. Removable and reusable. T-Sign Classic Adjustable Aluminum X Banner Stand Fits Banner Sizes From 23"X 63" to 32"X78"
T-Sign X banner stands get their name because when set up, the banner stand frame looks like the letter X. This stand is a Classic US Update Style, We improved the bottom of the stand to make them stronger so that it will be more suitable for outdoor display. 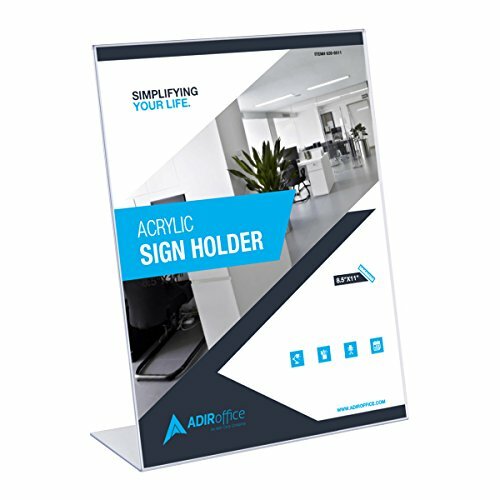 This style of stand is also lightweight and simple with a reputation for being the best option for customers looking for cheap banner stands. Since they are so inexpensive, they are a great option for large promotions where stands and banners need to be presented in many locations at the same time. Product launches in showrooms or retail store displays are among the popular uses for X banner stands. -Graphics Size: Width: 23"~32" Height: 63"~78"
T-Sign is a professional manufacturer of high quality sign stand, We have twenty years of experience in this industry, produced hundreds of thousands of stand products every month, from poster stands, banner stands, magazine stands, backdrop stands and X display, etc. Each of our products are carefully manufactured and rigorous tested before selling. T-Sign wants to keep bringing best quality stands to customers all over the world! Not just talking about it, we'll stick to it! 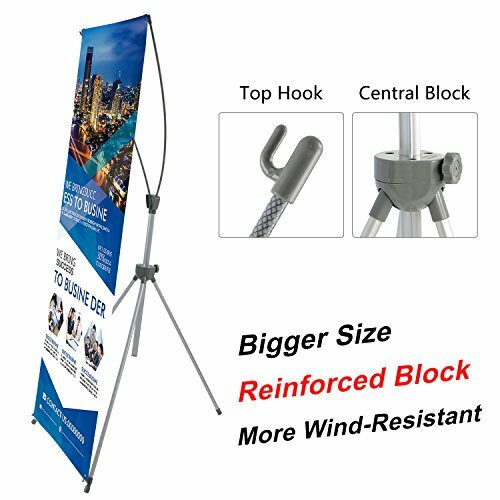 Reinforced block, Make the frame stronger and won't be torn up, Adjustable heavy duty tripod X frame banner stand fits any banner size Wide 23"~32" and Height 63"~78"
Versatile and built to last, the Adir Plexi Acrylic 8.5" X 11" Single Slant Back Design Sign Holder is a great way to advertise and display signage in any type of setting. It s expertly made of clear acrylic to provide long-term durability and protection for the advertisements inside, keeping them safe from stains, scratches and tears. The wide back flap on the frame securely holds the unit in place, allowing it to stand by itself on any table or desktop. Additionally, the slanted orientation furnishes an easy and clear, unobstructed view of the graphics within the display. A popular size in tabletop advertising, this 8.5" x 11" signage is an impressive way to display menus and drink specials on a bar or restaurant tabletop, channel lineups in hotel rooms, important information or photos at special events and conferences, and so much more. The paper loads easily through the side, and can be used to display your full-page ads while keeping them fully protected. For added convenience, this product is offered in a variety of different sizes to cater to the individual user's display needs. The 1, 3, 6 and 12 packs are great for smaller functions or events, while the 24 and 36 pack options are better suited for larger organizations that continuously promote specials and advertise their products. Furnishing ease-of-use, this acrylic display is an indispensable resource for restaurants, retail stores, schools and businesses of any kind! SELF-STANDING, CONVENIENT DISPLAY. With its wide back flap, this sign holder conveniently stands by itself on any table or desktop without difficulty. You can efficiently frame images, brochures, advertising pamphlets and important information in any location. HIGH-QUALITY, DURABLE CONSTRUCTION. Expertly made with clear, acrylic material to supply long-lasting strength and use, this card holder will protect and display your signs for years to come, keeping them safe from stains, scratches and tears. Although acrylic is lightweight, it boasts great strength, is shatter-resistant and won't break even if it hits the ground! SIMPLE AND EASY TO USE. 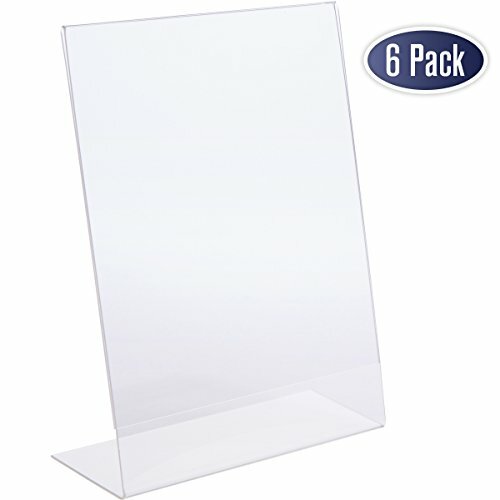 Each slanted sign holder conveniently loads from the side and can be used to display letter sized paper or cardstock. When necessary, you can use a damp cloth to wipe away any dust or grime from the surface. VERSATILE. 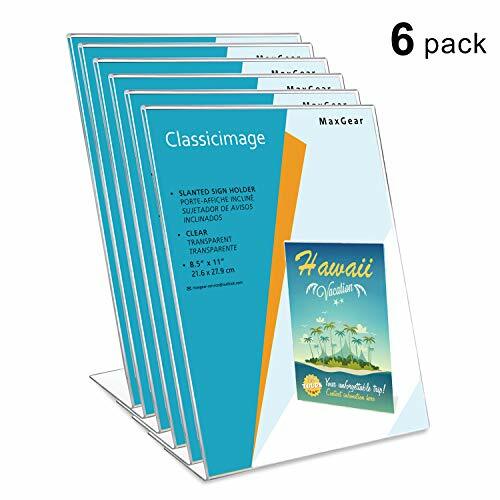 The most popular paper size, this 8.5 x 11 holder is perfect for displaying menus, drink specials, important announcements, photos and much, much more. It can be used by retailers, restaurants, trade shows, hospitals and any other location where you want to display your signs, certificates or advertisements. VARIETY OF PACKAGE SIZES. 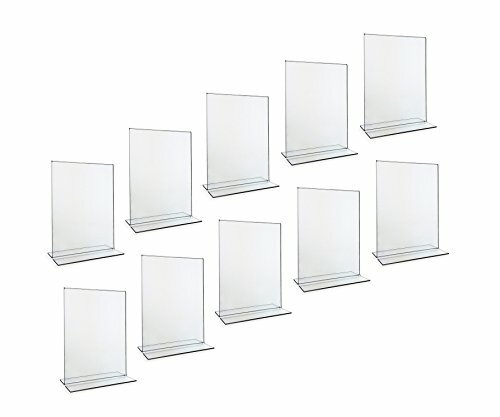 To cater to each individual's display needs, this Adir Plexi Sign Holder is available in six different quantity packs - 1, 3, 6, 12, 24 and 36 count. Each holder has an opening for easy paper insertion on the side, and is durably made to provide long-lasting strength and use year after year. Brand: Adir Corp. | Manufacturer: Adir Corp.
Searching For A More Reliable, Better Looking Acrylic Frame Than What Everyone's Using? Displaying your prices, product descriptions, menus, flyers, and other info properly is essential for the success of your business! Why waste your money on glass frames that cost a lot , have only one displaying side, are heavy, dangerous and hard to transport and offer nothing more than an 8.5x11 1InTheOffice sign holder? For maximum versatility, the upright, double-sided acrylic sign holders are a business person's best option. 1InTheOffice Vertical slanted sign holder holds your business signs, keeping the paper in perfect condition. Place the holder on a tabletop to display information to passing visitors. Literature slides in from the bottom. Sold as a Pack of 6. Designed for use on desk, countertop, or any flat surface. QUALITY PRODUCT THAT WILL SAVE YOU TIME AND MONEY - Dasher Products goes the extra mile by offering high quality genuine 3M adhesives. We package each frame in a poly bag and each pack of 6 is packaged in its own box (unlike other frames on Amazon which try to cut corners by using cheap adhesives and poor packaging). SWAP OUT PICTURES AND SIGNAGE IN SECONDS - Our high quality frames come with genuine 3M hook and loop double sided tape. Easily remove the frame from your wall to change out any pictures or signage and just simply place it back. PRODUCT DIMENSIONS - 8.5 inches x 11 inches. 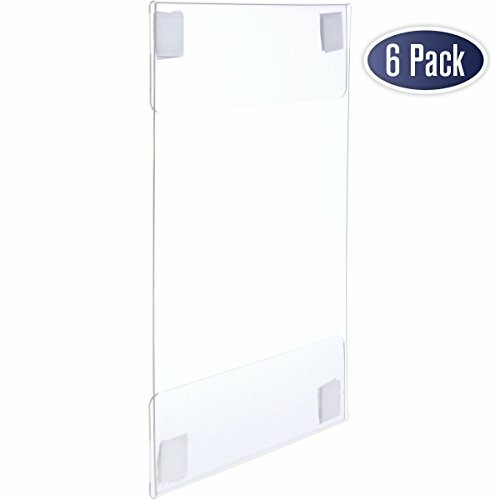 Pack of 6 Acrylic Frames with Hook and Loop adhesive tape. QUICK AND SIMPLE INSTALLATION - These acrylic frames have double sided permanent adhesive for easy mounting. No screws, no drilling, and no tools required. Will apply to virtually any flat surface such as drywall, metal, plastic, wood, and glass. 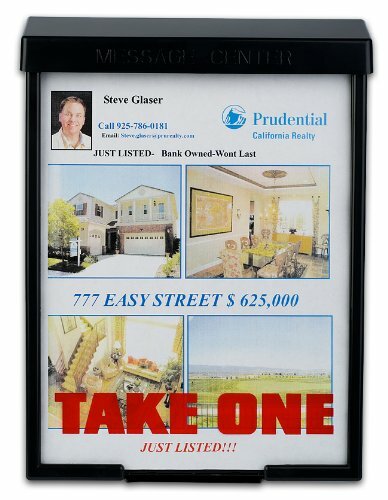 MULTIUSE FRAMES - Designed to hold signage/pictures both vertically (Portrait) and horizontally (Landscape). Will support any document up to 8 x 11 and is perfect for pictures, advertisements, signage, photographs, children's art and more. Perfect acrylic sign holder, 5" x 7". Pack of 10. Use in restaurants to display menus and daily specials. Use them in banquets and parties as table place holders. Use them in stores and businesses to display current offers and prices. These high-quality acrylic sign holders allow a full 5 x 7" sign to display without the bottom being covered up by the base. Easy to insert and replace the sign, and wipe clean. Please Note: These sign holders will not hold a regular 8 1/2 x 11" sheet of paper. We have many orders from people thinking that these are larger sign holders. The dimensions are: 5 x 7 inches. Made of top quality clear acrylic. Dimensions 5 x 7 inches. Ten sign holders included. Made of 304 stainless steel, standoffs is rustproof, corrosion resistant and against daily scratches, ensuring durability and longevity. Widely used for company, office, store, supermarket, shops, art exhibition, home, advertising sign and billboard, etc. Each glass standoff included buffered silica gel, which will protect your glass. Diameter x Length: 1/2" x 1" (12mmx25mm), elevates signage 0.8" off the wall. Thread Diameter: 8mm(3/10). Fits for the diameter of sign hole: 8mm-25mm. All Metal: Made of stainless steel with brushed nickel, rustproof, scratch-proof and corrosion-resistant. Application: Suitable for company, office, store, supermarket, shops, art exhibition, home, advertising sign and billboard. Package Included: 20pcs glass standoffs, 40pcs rubber spacers, 20pcs screws and 20pcs wall anchors. Rubber spacer for protecting your glass and acrylic boards. 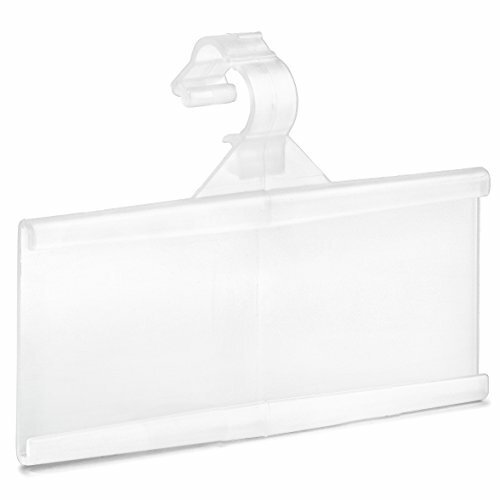 Azar's 252012 counter trifold brochure holder is 4.125-Inch Wide by 2-3/4-Inch Deep by 7-1/4-Inch High. 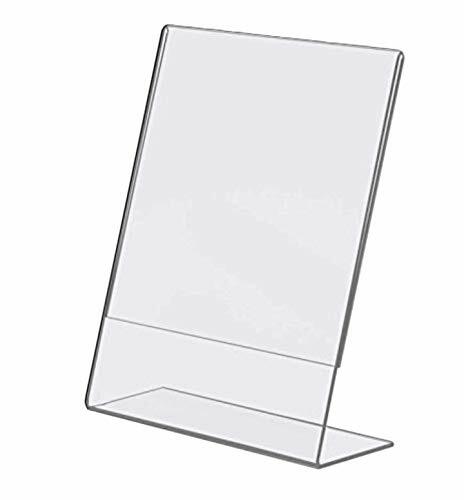 This brochure holder has a front lip that is 2.75-Inch H. It is made of quality acrylic and is perfect to display any type of brochure or advertising material on a counter top. This holder is sold in packs of 10. 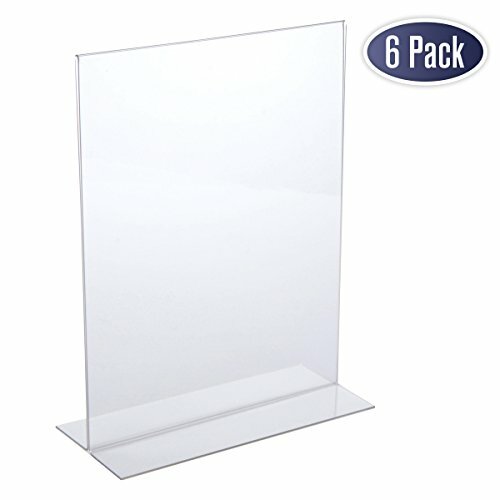 STURDY ACRYLIC CASE - MaxGear slanted sign holder is made of premium-quality clear acrylic plastic. This type of material is durable enough to resist scrapes and scratches. Its transparent exterior, allowing people to view your brochures from afar. VERTICAL ORIENTATION - This acrylic sign holder presents an 8.5x11 inches paper in vertical orientation. This package include 6 pieces sign holders. SLANT-BACK DESIGN - Practical inclined support lets people see its contents easily, even when standing. Allows free-standing presentation of menu or other. Wide flat base keeps the unit stable on counters, tables, desktops etc. MUlTIPURPOSE - Perfect for post photo, poster, brochure, menu, schedule, children's arts, list, image, advertisement and regulation at home, office, store, restaurant, church, hospital restroom and school. WARRANTY - MaxGear promise you a 12 month satisfaction guarantee if any quality problem.24 hours instant respond by Amazon Message, carefree service. Deluxe A-frame sandwich board signs are the perfect way to easily display your message outdoors. The large 2 ft. x 3 ft. signs can be quickly positioned on a sidewalk or parking lot to draw customers into your store, or direct people to your booth or event. These sign frames have built-in tabs on the left and right side to quickly swap out your message when needed. Sign is hollowed out and can be ballasted with up to 10 lbs. of sand on both sides for added wind/weather resistance. Display panels not included. 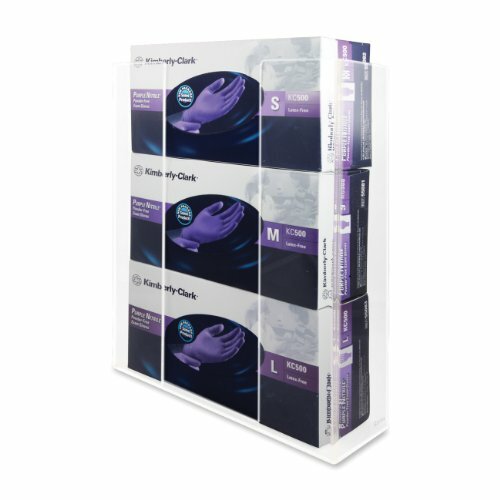 Acrylic glove box holder accommodates most all brands and sizes. Place on a countertop or mount to wall through predrilled holes (screws not included).